Throughout the month of August we here at the Sports Script are going to answer the 5 key questions regarding each division in the NFL. We have gotten together 3 of the Sports Script writers Ricky Valero, Matt Wincherauk & Chad Woodroof to answer the questions. These will lead up to the ultimate reveal of everyone’s prediction for the NFL season. Today we look at the NFC West. 1. Which player needs to step up the most this year? Ricky: Sam Bradford. How good the Rams do in 2013 rests on the shoulders of Bradford. The Rams have surrounded him with weapons that should help him succeed. If he fails to make important strides I think the team may need to look for a QB to bring in for competition in 2014. Matty W.: Colin Kaepernick: I’m not a huge fan of Kaepernick but I know how talented he is. But this year really hinges on his growth as a quarterback. Everything is there once again for him, it’s up to him to get back to the Super Bowl and end it with a win this time and nothing less for the 49ers. Chad: Sam Bradford. His offense lost some key players, but gained Tavon Austin. This is the year that Bradford needs to step up and make everyone around him better. That’ll prove that he was worth being picked as high as he was. I was big on Sam coming into the NFL — It’s almost make or break time for Mr. Bradford. 2. Which coach has the most pressure to win this year? Ricky: Jim Harbaugh: This may just base on the fact he expects to be great. He took this team to the Super Bowl last season and came up short but I look for him to have his team heading in the right direction again this year. Matty W: Jim Harbaugh: Harbaugh is one of the best coaches in the NFL and while I don’t think he would be in danger of losing job any time soon, he suffers from the weight of “Super Bowl or bust”, like Kaepernick. This 49ers team is too good not to get back to the Super Bowl. Chad: Bruce Arians. Stepping into a new situation, in a division where all the other coaches stepped in and had an IMMEDIATE impact on their teams, Bruce has to win or be extremely competitive at least. He will need to gel with Carson Palmer very well for this to happen. Notably, Arizona has boatloads of defensive talent. 3. Who is the Sleeper player to watch in the division? Ricky: Daryl Richardson: This guy is can be the next stud RB in St. Louis. If you take out a crappy December (16 carries) he had 82 carries for 451 yards, which comes to an average of 5.5 YPC. He is going to be a big key in Sam Bradford taking this team to the next step. Matty W: Tavon Austin: I love Austin. He was easily my favorite weapon in this year’s draft, and with Amendola and Jackson gone, he’s going to have to shoulder the weight of the offense on him. He can do everything, so look for the Rams to get him involved in as many plays as possible. Chad: As I was the only one who even had faith in Russell Wilson and knew who he was, I wish this were August 2012!! For 2013 though, I’m thinking someone on the Rams. Since Tavon Austin really isn’t a sleeper, I’ll go with Daryl Richardson the Running Back. He’s a little undersized, so I have a little concern in his making it through the entire season as the main option. He averaged 4.8 yards a carry on roughly 100 carries last season. His numbers should be good if he can play all 16 games. 4. Which player means the most to their team’s success this year? Ricky: Russell Wilson: I am not Wilson believer, yet. He can make me a believer this season. I think he is the heart and soul of this team and this team goes as far as he does. Matty W: Russell Wilson: Wilson had a magical season last year, before falling just short of the Falcons. With Harvin down for a long time, he’s going to have to carry this offense. Lynch is a great back, but I don’t see him being able to replicate his numbers from last year. Chad: Colin Kaepernick. There is no more Alex Smith in town in case Colin goes down. I still have A LOT of questions on whether he is even legit. He has maybe the best solid rope spiral but I’m not sure how good he is at making reads 3, 4, and 5. If he’s running around all the time there is a high possibility of injury. I doubt the 49ers make it back to the Super Bowl. If they do though, it’ll be because of Colin. 5. How will the division play out? Ricky: Seattle Seahawks: 11-5 – I have the Seahawks edging out the Niners based on conference record. I think both teams are going to struggle in certain points in their schedule but I see the Seahawks taking the NFC West crown. San Francisco 49ers: Another division crown is in the works for the Niners, despite the loaded Seahawks. This is arguably the toughest division in football, but the 49ers are proven, and most well rounded. But can Kaepernick really lead them to another Super Bowl? They end the season with a record of 13-3. Fantasy Football season is upon us. Which means that millions of people around the world are drafting their teams. So I am here to bring you my latest rankings. Today I am going to give you my RB Rankings. I had the opportunity to see an advance screener of You’re Next thanks to Cinemit & GoFobo. When I first saw the trailer I knew this would be a movie that I would have to see in theaters. I am not a huge horror movie fan, especially the direction they have pulled with so many found footage films over the last few years. So as I was excited to see what this movie could bring to the table I was equally optimistic. So after seeing the movie I am going to give you the 10 things I did and didn’t like about the movie. Story: When the Davison family comes under attack during their wedding anniversary getaway, the gang of mysterious killers soon learns that one of the victims harbors a secret talent for fighting back. 1. This was the 1st film I have ever seen of Adam Wingard’s and I won’t lie it was a pretty impressive 1st impression. From start to finish he built a solid story that kept you guessing. It had a very nice slow build when they were introducing the characters and BAM right into some serious bloodshed. It was everything that I enjoy about a good horror movie. He really put together some awesome action/kill scenes in the film. Whether it was a dumb move from the “bad guy” or it was a smartly place board with nails in it, he really went out of his way to make some really cool killings. 2. There were some nice twist and turns. You could see some coming and then you had a few that were a nice surprise as well. 3. The score/music. Every great horror movie has some great music/score. This had it in here and I loved every minute of it. When killing someone in a movie it can really be ruined by either a crappy set up or a poor score. 4. I really liked the dysfunctional family idea they had for this. It wasn’t a perfect family that was unexpectedly attacked. 5. Sharni Vinson (Erin) was nice on the eyes and was the star of the show. 6. They made the vocal point of the movie the killings. That isn’t done in many horror movies anymore. 7. The Ending was awesome. That’s all I will say about that. 8. I guess you could complain about the acting, but with a low budget horror movie you get a bunch of C and D list acting. 9. They had some poor attempts at some comedy that came off pretty rough. 10. Lastly, I would have liked to see a bit more gore and blood. It wasn’t over the top like “Evil Dead” was this year but they could’ve made it a little bit more gory. Overall this is the best horror movie I have seen in a long time. Wingard brought a lot of key components to this movie that I really enjoy. I enjoyed the smart killings, the various ways of how he killed some people and they provided an awesome score to go with the flow of the movie. I would recommend any horror fans to see this movie this weekend when it comes out. You’re Next comes out in theaters this Friday. Fantasy Football season is upon us. Which means that millions of people around the world are drafting their teams. So I am here to bring you my latest rankings. Today I am going to give you my QB Rankings. Why MLB Should Suspend Ryan Dempster for the Year. No matter how you feel about Alex Rodriguez, what happened last night is inexcusable. Ryan Dempster not only threw at A-Rod but, even worse, on a 3-0 count. He should be suspended for the rest of the season. Joe Girardi said it best. He is correct. No matter how you feel about throwing at a player on purpose, it is outright WRONG. Players have suffered injuries and concussions from being hit by pitches. As a pitcher, you are trusted every time you step on the mound with an object that can kill or injure someone if you hit a player in the right place. I will not justify what A-Rod has done. He lied. He tried to cheat the game by getting an advantage by using steroids. He should face a suspension (not 211 games, but that’s for a different article for a different day) but shouldn’t have to worry about stepping up to the plate and being beamed by an 85+ mph pitch. With reports coming out now that Dempster had spoken about how he planned to hit A-Rod when he faced him on Sunday, just shows that this was premeditated. Furthermore this shows why he should be suspended for the rest of the year. With the sensitive issue we are dealing with, the Umpire made the wrong move by just “warning” both benches and then tossing Girardi out of the game for coming to the defense of A-Rod. Dempster should’ve been tossed considering the count was 3-0. If baseball shows an injustice by issuing a small suspension or none at all, it will just go to show that baseball is OKAY with putting a man’s career in jeopardy at the plate. Who’s to say this won’t happen again? Who’s to say that next time the guy throws at his head? No one knows, but now with Dempster’s actions, we are here to play a game of “what if” with a player’s life. Of course A-Rod had the ultimate redemption by hitting a solo shot off Dempster cutting the Red Sox’s led from 6-3 to 6-4. As he hit home plate, A-Rod stopped, clapped his hands together and pointed to the sky, taking a page out of David Ortiz’s book of celebrating HRs. The Yankees went on to take the lead and beat the Sox 9-6. In the end I hope the commissioner makes the right decision and makes sure we don’t see Dempster on the mound for a while. I was at one of my favorite ice cream places in the world, Cold Stone Creamery. When it was my turn to order, the only sizes they have are Like It, Love It And Gotta Have It. I got to thinking, when it comes to Fantasy Football there are players who I like, that I love and gotta have at all times. Ice Cream and Football, I think, go hand in hand and I am going to tell you about each position – who I like, I love, and gotta have in the 2013 Fantasy Football season. I will also be giving you my favorite creations as well. Today I start with the Quarterbacks. In his Rookie season last year, Luck brought his A-game; he turned a team around that was 1-15 the year before, took them to the playoffs, and finished 9th among all quarterbacks in Fantasy Football. Heading into this year he is ranked the 10th best quarterback among all rankings, although some people are expecting a bit of a sophomoric slump. I am not one of them. I see a player who will not only be in the top 10 in Fantasy, but he will have an even better season this year. New offensive coordinator, Pep Hamilton, is planning on getting the Colts’ running game started — which will open up the passing game in 2013. This is why I like Luck, and so should you. Newton has never been one of my favorite quarterbacks in football, but I can’t deny his talent or what he means for Fantasy Football. Last season, as expected, his total TDs regressed from his rookie season (35-27). However, he still finished 4th among quarterbacks, which is right around where he is being ranked this year as well. Reports state that they plan on trying to keep Newton in the pocket a bit more this year, this could be good for his passing numbers this year. His rushing yards may regress but he is Carolina’s best option at the goal line which means he will still get the rushing TDs needed to produce great Fantasy numbers. I am not all about drafting quarterbacks early but, if you are, and Newton is available late 3rd or early 4th, he is the quarterback you should be drafting. He provides a nice 1-2 punch that most of the other top QBs can’t offer you. This is a big year for Cutler – it is the last year of his contract with the Bears. Therefore, this season could play out one of two ways: he ends the year by taking the Bears to the playoffs and gets paid, or he has a rough season and is looking for a job elsewhere. I think he is going to break out in a big way. New Head Coach Mark Trestman is offensive minded but Cutler hasn’t been around him in a few years. While OC of the 49ers, Trestman lead the league in yards and pass attempts. In 2012, when he was OC of the Raiders, Rich Gannon led the league in yards. He even got solid seasons out of the likes of Scott Mitchel and Jake Plummer. Basically, I feel the Bears are going to throw the football, and throw it a lot in 2013. During the offseason, they added super talented Martellus Bennett to play along with Marshall, Forte and Jefferies. I look for Cutler to have the best season of his career. With his ADP among QBs 17th and 133rd overall (10th-11th round), he has some tremendous value this Fantasy Football season. I think Cutler finishes in the top 12 this year and is an indication of why waiting to draft a QB is a smart thing to do. WWE Summerslam is scheduled to happen tomorrow night and our team of writers got together to give us their predictions on who they think will win at the PPV. Make sure to hop on over at Twitter where you can follow @thesportsscript – @mattbell211 – @TheMattyWin & @rickygangster as they will be live tweeting Summerslam. Ricky: This could steal the show for me. When RVD came back Ambrose was one of the guys I was hoping that he would be able to come back and face. I think Ambrose somehow steals this one away from RVD. Matty W.: This match was made only on the go home show of RAW last week after Van Dam beat 19 other superstars in a Battle Royal. There could be a lot of shenanigans going on in this match with the other members of the Shield lurking, and Big Show and Mark Henry involved as well, things could break down. I’ll take Dean Ambrose to retain his belt. Matt B.: I really would like to see RVD win here but some how the Shield screws him and Ambrose wins. Ricky: Have I mentioned my huge crush on AJ lately? Didn’t think so. But I see Ziggler & what’s her face squeaking out a victory finishing off this fued. Matty W.: In a perfect world, these matches are seperated, but unfortunately we could only see it happen as a mixed tag. These matches are really hit and miss, but Ziggler could make this whole thing gold. I’ll take Ziggler and Kaitlyn. Matt B.: Dolphs team will win. Ricky: They both are on the “hit” TV show Total Divas. I think Bella is more of a “star” of the two, so give me her for the Victory. Matt B.: Bella twins will find a way to get the win over Natalya. Ricky: The battle of Rhodes and Matty W’s BFF Sandow. Rhodes is slowly getting built up towards a great baby face push but I personally don’t think Sandow should take the loss here. With that being said I think Matty W’s BFF takes the loss to Rhodes. Matty W.: These two have had one of the more interesting buildups to SummerSlam. Damien Sandow is absolute gold in the ring and especially on the mic and Cody is starting to really get over as a good guy, but only one man can win this one. Give me Sandow to continue his great roll towards a WHC reign. Matt B.: Cody Rhodes is in line for a push and this is it! Ricky: I love the Wyatt family. I have watched them since the time spent down in NXT. I expect this to be a really good match (even though it’s a ring of fire match) and I see no choice but to give Wyatt the win. Matty W.: This match is going to give me goosebumps. The Wyatt Family have been absolute gold since making their way to the main roster and have targeted the Devil’s Favorite Demon Kane. While this isn’t an “Inferno Match”, it should add a neat element. I’m going with Bray Wyatt to knock of the Big Red Monster himself. Ricky: I am a huge fan of Del Rio but I just don’t think he is Heavyweight Champion material but I am not sure Christian is either. This match could surprise people and actually be good if it is given some time. I think it’s a toss up, I flipped a coin and head wins. So give me Del RIo to retain. Matty W.: This match has had a pretty poor build, and I would be excited for the match itself, but we’ve seen Christian and Del Rio go one-on-one in non-title matches recently. With the way that Christian is being booked, super strong that it, I would believe that Del Rio will walk out with his WHC belt. Matt B.: Alberto Del Rio as I can’t find a way Christian carries a title. Ricky: I am really looking forward to this match. Punk and Lesnar could have one hell of a match here. I am interested to see how they are going to go about doing this match though. Is this going to be an actually wrestling match or is this going to be a knock down drag out fist fight. Either way I expect Punk to get the victory here. Matty W.: This match has had almost as good a build as Bryan-Cena. The feud itself is more Punk-Heyman, as we’ve seen Punk come close on a number occasions at getting his hands around Heyman’s fat neck, but I don’t think he’ll get his opportunity here. I’m taking the Beast Brock Lesnar to take this one and somewhere down the line, for CM Punk to give the two of them their comeuppance. Ricky: I truly cannot wait for this match. They have built this up really good and it has the potential to be a great match. I really hope that with HHH being the special guest referee it doesn’t have a hocus pocus ending. Cena’s injury gives me a bit of a concern on how much he is going to be able to put into this match. Sadly, I think we get the stupid ending we all don’t want and Cena retains the title. But I think Randy Orton comes out and cashes his MITB briefcase and pins John Cena after a Pedigree from HHH. Matty W.: This is the big one, the one that could change the direction of the WWE. Bryan has been on an unbelievable run right now, no one is getting the kind of responses that he’s getting, and I think this ends up very well for our bearded friend. 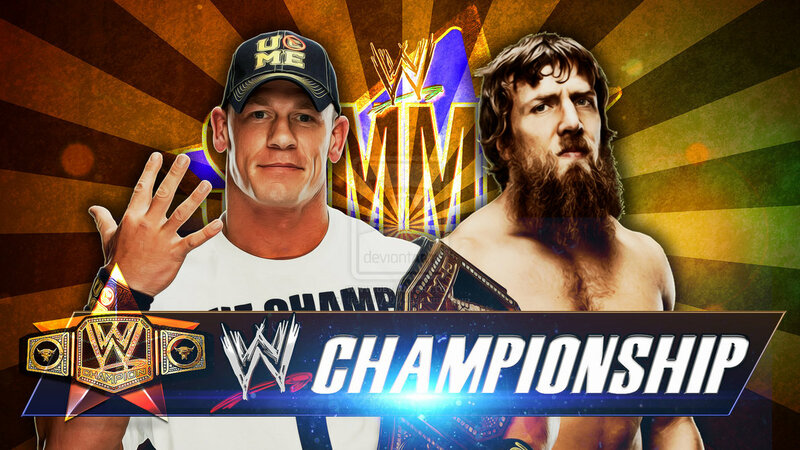 Daniel Bryan WILL defeat John Cena for the WWE Championship, the question is, what does Randy Orton do? Matt B.: Daniel Bryan simply because he is the biggest thing going right now and I think Cena needs time off for surgery. Throughout the month of August we here at the Sports Script are going to answer the 5 key questions regarding each division in the NFL. We have gotten together 3 of the Sports Script writers Ricky Valero, Matt Wincherauk & special guest Mandi (@dvnmsm) to answer the questions. These will lead up to the ultimate reveal of everyone’s prediction for the NFL season. Today we start off with the NFC South. Ricky: Josh Freeman: This is a make or break year for him. I believe he needs to take this team to the playoffs if he plans on being the starting QB for the Bucs next season. Matty W.: Matt Ryan: Ryan may have finally gotten over the one playoff win hump, but he’s not out of the fire yet. He’s got to give more than just one playoff win with such a good regular season team. Ryan is on fire in the regular season, but he needs a Super Bowl appearance to validate that success. Mandi: Matt Ryan. Last season he finally took a solid step into the leadership role on his team, and this season he needs to take that last step. The fans expect it. He’s more than capable. Ricky: Ron Rivera: He is 13-19 as HC of the Panthers. I think he has to make some serious strides in order to keep his job this year. Matty W.: Sean Payton: After serving his one year suspension as a result of bounty gate, Payton has returned and is being hailed as the Saints savior. If he can’t provide playoffs and some wins, he’s going to be looking at a hot seat. Mandi: Sean Payton. Since the Saints tied for second place in the division with the Bucs and Panthers, I think most fans equate his return from suspension as a return to the team’s winning ways. Ricky: Darrelle Revis: I believe the health of this man can determine whether or not the Bucs will contend this year. If they get a healthy Revis they have a real shot at making some noise in this division. Matty W.: Lance Moore: He may not be the biggest name weapon on the Saints behind Coltson and Graham, but he’s one of Brees favorite targets. And in what should be a huge bounce back year for Brees, I expect Moore to look fantastic alongside him. Ricky: Matt Ryan: Ryan goes down this team has no chance at making the playoffs. Matty W.: Cam Newton: Cam Newton has all the makings of a star, and has showed the ability, but the problem is he’s surrounded by such a lackluster group. With overpaid running backs, an aging star receiver, and a mediocre defense, Newton is going to have to shoulder a lot just for the Panthers to make a dent in the NFC South. Mandi: Hmm. That’s a toss-up between Ham…er…Cam Newton and Josh Freeman. Both of these guys seemed to fade into the woodwork last season. They each need to make loud statements through their play this season. Atlanta Falcons 11-5 – The Falcons have a tough schedule ahead of them this year and if they lose a couple of games I have them slated to win they may miss the playoffs this year. But with the addition of Steven Jackson this team could go all the way. Atlanta Falcons: Once again I think the Falcons win this division as they have the most complete team. At a mark of 11-5, it seems like a bit of a regression, but the fact is this division won’t be pushovers like they were last year. Football fans can’t wait for the day in April when their team’s upcoming schedule is released. It’s become the event that signals that the Draft is coming, camps aren’t too far behind, and that the countdown to opening day is around the corner. Even when they don’t involve our favorite team, there are some games that football fans recognize as must-see matchups. Three of those games are on tap for the Denver Broncos this season. Peyton and company will travel to Met Life Stadium week 2 for what the media has dubbed the “Manning Bowl.” This meeting will be the first since the Giants’ two Super Bowl wins, and since Peyton’s return to football after missing the 2011 season. The Mannings have faced off only twice in their careers. On September 10, 2006 the Colts bested the Giants by a score of 26 – 21, and on September 19, 2010 Indy pummeled New York 38 – 14. Giants fans will tell you that the outcome will be different this year, because Eli is now a 2-time Champion whose confidence and talent have finally developed. Broncos fans will counter that Peyton’s multiple award-winning talent and additional years of experience will win out yet again. No matter how gracious and complimentary the brothers are of each other in the media, and despite Eli’s claims that there is no sibling rivalry because he won’t let one develop, there is bound to be some truth to this. Week 7 takes the Broncos to Lucas Oil Stadium, better known to many as the House that Peyton Built. There is no doubt that there will be much hype and sentiment surrounding this homecoming, and that the fans will welcome the man who led their team for 13 seasons with quite an ovation. The Broncos/Colts series began way back in 1974 when the Colts were still in Baltimore. The first game between the Broncos and the Indianapolis Colts was in 1985. Denver leads the series 11-10, but since Peyton was drafted the Colts have won 8 out of 10 matchups. Peyton will face off against fellow 1st overall draft pick Andrew Luck, who is not just the man who took his place, but had, aside from completion percentage, a much better rookie season than Peyton had with the Colts. Luck even got the Colts to the first round of the Playoffs as a rookie. This game is not only a matter of pride for Peyton, it’s one in which he wants to drive the point home that he hasn’t lost a step. Manning had to stand by on the sidelines and watch in frustration as his team struggled through mediocrity in the 2011 season. Although he was healthy, the Colts weren’t willing to risk another losing season, and chose to release him to make room for a younger QB. The Washington Redskins travel to Denver week 8. This game marks Mike Shanahan’s return to Sports Authority Field at Mile High since he was fired back in 2008, He’ll face the quarterback to whom his (then) Broncos lost back to back Wild Card Playoff games in 2003 and 2004. Denver and Washington have played a total of 12 times since 1970. The series is tied 6-6, and Washington won the last game in 2009 by a score of 27-17. For the second week in a row, Peyton will face a standout rookie who was selected high in the draft in Robert Griffin III. Griffin will be in the midst of a comeback season like Manning was the season before. If the Redskins are playing well and RGIII has improved on his already impressive rookie performance, this will be a great mid-season matchup. Mark these three games on your calendar; they’ll offer more than great football. The first may very well be the last time we get to see the Manning Bowl, and the last two represent the official changing of the guard in the NFL at quarterback.